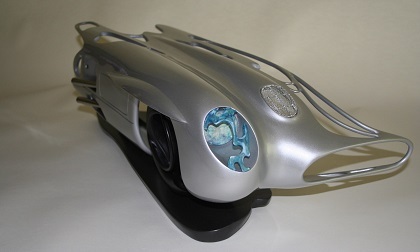 LA GRANDE, Oregon – Nov. 3, 2016 – Grande Ronde Symphony Association (GRSA), Oregon’s oldest continuous running symphony, has partnered with renowned automotive artist and Automotive Fine Arts Society (AFAS) member Dennis Hoyt, to host an auction that will feature a one-of-a-kind sculpture donated by Hoyt. All proceeds from the online sale will benefit the association’s mission to support and promote the ongoing music programs of the Grande Ronde Symphony Orchestra, the Grande Ronde Student Symphony, and the Grande Ronde Chamber Series. Beginning, Sunday, November 13, a link will be placed on GRSA’s website marking the start of the auction. For those interested in the sculpture, bidding will last until Wednesday, November 23, when GRSA will announce the winning bidder. Inspired by Sir Stirling Moss’ historic victory of the 1955 Mille Miglia, Hoyt’s art piece entitled “300 SLR” celebrates Moss’s unwavering commitment to excellence at the epic race. He won Italy’s thousand-mile “Mille Miglia” road race driving a Mercedes Benz 300 SLR. A truly remarkable wood and steel sculpture, the artwork measures approximately 27”x11”x9” and features Moss’ signature. In addition to the sculpture, the winner of the auction will also receive a signed letter from Sir Stirling Moss briefly describing the race and his association with Dennis Hoyt. Hoyt is an artist in the true renaissance mold. A member of AFAS since 1988, he is an award-winning sculptor. He was the first artist to be unanimously elected to the Automotive Fine Arts Society and was the inspiration and first recipient of the Raymond E. Holland Award for Vision and Creativity. His work can be found in museums and private collections around the world, in countries such as the U.S., Germany and Japan. Hoyt is a regular attendee of the Pebble Beach Concours d’Elegance and was a former curator of the “Galleria d’Arte Ferrari” at the Cavallino Classic alongside his wife Susan for 17 years.